Islam Awareness Week starts tomorrow! Our annual Islam Awareness Week starts tomorrow! 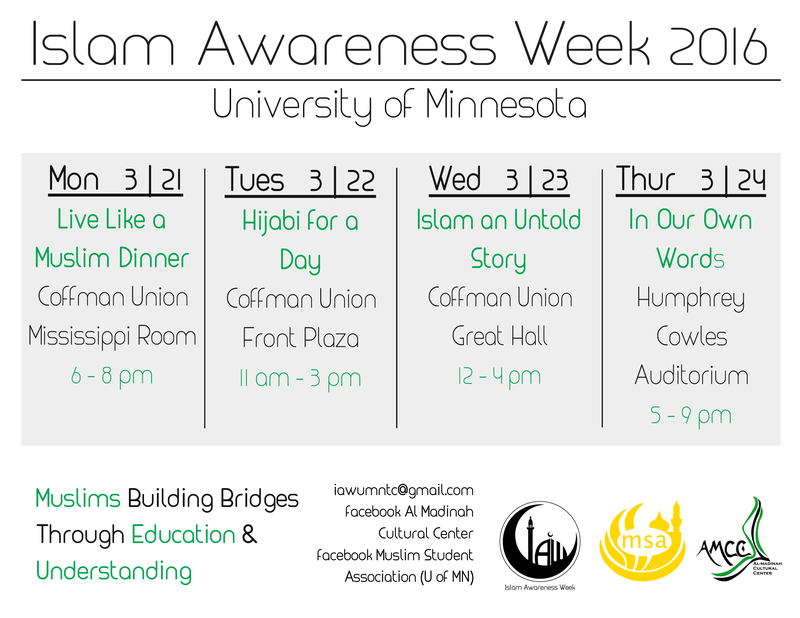 Use the use the #iawumn2k16 or the #iawTaughtMe hashtags on social media to reflect on IAW! We will be hosting a variety of events each day of the week that deal with different aspects of daily and typical Muslim life. Definitely not a week you’d want to miss out on! We’re kicking off our week tomorrow with our Live Like a Muslim event. There, we will be listening to the experiences of 14 students who chose to experience a new lifestyle by living like a Muslim for 1 week. We’ll get opportunities to ask them questions and reflect on their experiences living during that week. Dinner will be provided during the program. Join us in the Mississippi Room on the third floor of Coffman on tomorrow at 6:00pm!